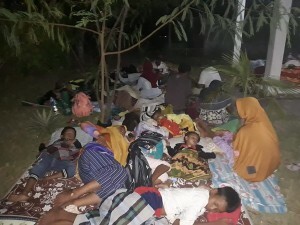 Video footage from Luwuk city showed scared residents some carrying children running from their homes and racing to higher ground on motorcycles. “I ran straight outside after the earthquake everything was swaying,” Palu resident Mahfuzah, 29, said. The force of last year’s quake saw entire neighbourhoods levelled by liquefaction a process where the ground starts behaving like a liquid and swallows up the earth like quicksand.